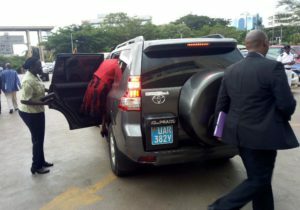 KAMPALA – The Committee on Commissions, Statutory Authorities and State Enterprises (COSASE) has directed embattled former Bank of Uganda (BoU) Director for Supervision, Justine Bagyenda to return cars and security as she is no longer an employee of the Central Bank. The directive comes after the Committee investigating how BoU sold off seven commercial banks learnt that Bagyenda still had all the privileges of a senior staff member of the Bank. Ms Bagyenda was fired in February last year and enjoying these privileges is in contradiction of Article 164 of the Constitution. At an earlier interaction, BoU Governor Tumusiime-Mutebile told COSASE that Bagyenda’s privileges as a senior bank official would expire on December 31, 2018. However, her successor, Dr Tumubweine Twinemanzi, informed the Committee today Friday, January 11 that Bagyenda’s privileges were extended until June 2019. Ms Bagyenda is a principal witness to the Committee proceedings that have been ongoing since the last quarter of 2018. However, COSASE chaired by Bugweri County Member of Parliament Abdu Katuntu, was not happy with Bagyenda’s reasoning that led to the extension of the said privileges. The Committee, therefore, ordered BoU to withdraw all privileges to Bagyenda with immediate effect. The Committee also asked BoU to calculate how much has been spent on Bagyenda in monetary terms since December 31 so she can pay the money back.